When the light is good, shooting can be a euphoric experience that goes on and on. 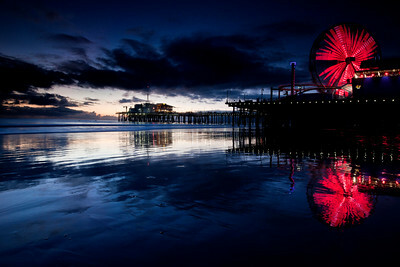 The Santa Monica Pier Ferris Wheel adds an extra dimension of joyful light during a colorful sunset. 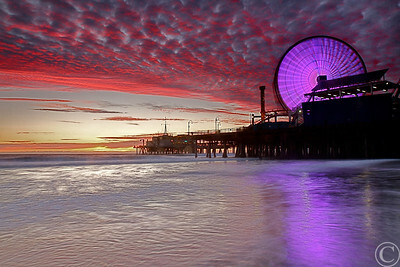 I stood in thigh-deep hour with my tripod for over an hour on this evening, marveling at a stunning procession of light and color arrangements in both sky and Ferris wheel. I have dozens of shots from this evening that rival some of the best photos I have taken. It’s fascinating how I can go months without getting a good image and then have a one-hour session that provides scores of great images. 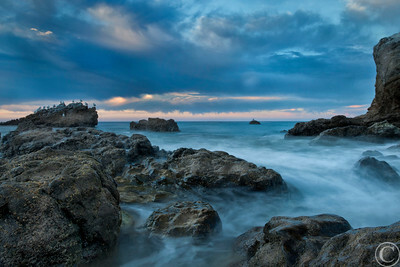 Leo Carrillo is one of the most therapeutic places I have ever visited, and I visit often. 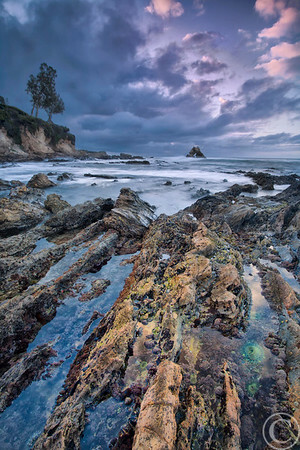 The rocks, the tide pools, cormorants, sea lions, dolphins, whales, great surf, fisherman, romance, family, children all revel in the glory of this majestic river mouth rock reef. This shot is one of three that was created using a new and rather dangerous process that I experimented with in late 2013. I hope to further explore this technique in the near future. This image was another stroke of luck. I literally just sat down on the beach after getting my son into the water for a morning surf session when I noticed the sun was about to peek over Point Dume right as this surfer cruised by. No matter how much time I spend at this beach, something stunning and new jumps out at me every time. These tide pools are astonishing at low tide. If you look closely, you will find a red tag installed by the park service on the rocks at lower left, The tide pools are protected and monitored primarily to ensure the health of rockweed. Rockweed is to tide pools what kelp is to deeper waters: food, habitat and protection. Eliminate rockweed and the population of small marine animals drops precipitously. Beach goers, insensitive to the dangers of habitat destruction, have trampled large expanses of rockweed in tide pools from Washington to Ensenada to near oblivion. Two Cal State Fullerton researchers may have found a way to reverse that devastation. Jayson Smith, lecturer in biological science, and biology master’s student Stephen Whitaker, working in the Little Corona del Mar area of Newport Beach, have developed an efficient way to restore rockweed to its native habitat. The solution seems deceptively simple: Go to untrammeled areas where rockweed thrives, saw off pieces of rock with healthy rockweed attached and glue the pieces to the sides of rocks in the damaged tide pool. But it took three years, multiple approaches and an $85,000 services agreement from the city of Newport Beach in 2006 to get there. This was the second time I shot Little Corona. The first time was two years prior and I studied those shots repeatedly to create a plan for this image. 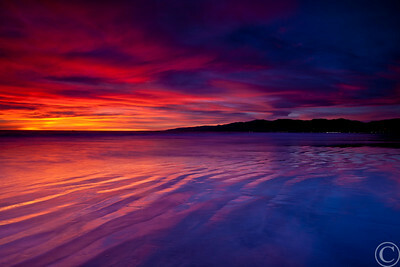 The blue hour in the morning, dawn to sunrise, produces some of the fastest color changes imaginable. I spent about 15 minutes in this spot and have an image of this same scene, taken five minutes after this, but dominated by orange, with only hints of blue (see Topanga Blue to Orange #2). Living a mile from this astonishing location is a great blessing. Yet the overwhelming majority of my community never visits the beach. This shot was taken on one of those frequent weekend evenings when, just before dinner, it occurs to me that I should head down to take in the special golden sunset hour. 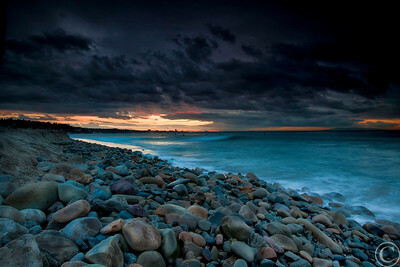 The blue hour in the morning, dawn to sunrise, produces some of the fastest color changes imaginable. I spent about 15 minutes in this spot and have an image of this same scene, taken five minutes priot to this, but dominated by blue, with only hints of orange (see Topanga Blue to Orange #1). 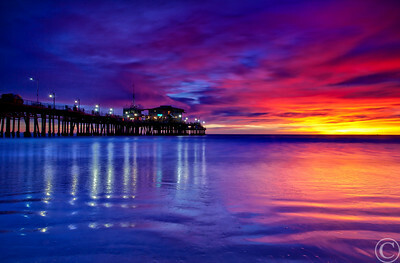 I have not seen another sunset with these dizzying colors since this day. The experience was a visceral rush that put on a visual show for over 40 minutes. It was great fortune that it occurred at low tide, allowing me to spend the entire duration in shallow calm water. 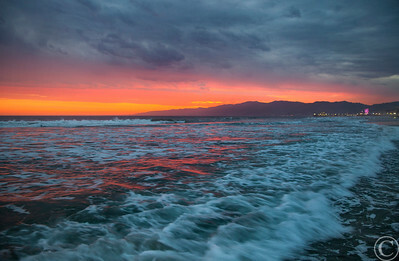 Ironically, this is one of the most polluted sections of the Santa Monica Bay. Trash from the pier and a daily crush of visitors from all over LA creates consistent mounds of trash. 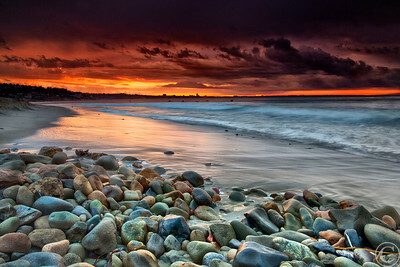 It’s a reminder that earth remains beautiful and pure regardless of our actions. This shot was taken during the same session as Taken Away. The contrast between this scene, looking out to sea, vs. the scene that occurs on this beach each day, is even more pronounced in this image. 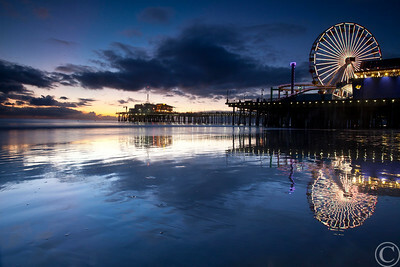 I went through an extended period of shooting the Santa Monica Pier from this angle at sunset. 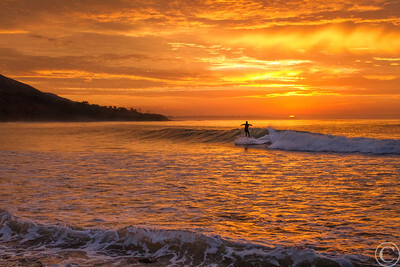 This was actually my first day out there, and it happened to be an epic sunset. I don’t think I have seen clouds and colors quite like this arrangement of metallic silver and red before or after.